2008: Education and preaching were two of the foundation stones of the work of Canon Maurice Burrell, who died suddenly at the Norfolk and Norwich University Hospital, aged 77. He returned to his native Norfolk to become diocesan director of education in 1975 - a post he held for 12 years until taking over as full-time director of training. A keen runner, he completed about 20 marathons until advised to quit on medical advice around his 70th birthday. He took it up when he was 50 because he wanted to get fit. He finished in five hours 50 minutes but just a few weeks later, completed the Evening News Centenary Marathon in four hours 35 minutes. Canon Burrell was born in Norwich on August 19, 1930 and became a member of St Augustine's Church. He was brought up in Rose Yard on the Larkman estate, later living in Motum Road. He retained his links with Larkman Middle School and ran the 1990 Paris Marathon to support the £360,000 appeal to build a new St Elizabeth's Church on the estate. He won a scholarship to the City of Norwich School but on the way home would have to hide his grammar school cap. He left school in 1946 and became a draughtsman before being called up for National Service. Ironically, his diocesan office in The Close was just a few doors away from his first job. He studied at Tyndale Hall, Bristol, having graduated in theology in 1954. Ordained at Southwark Cathedral in 1955, he became a curate at Wandsworth. By sheer coincidence, his priest was also a Norwich man - at the same grammar school and a member of St Augustine's. Canon Burrell returned to Norfolk in 1959 becoming rector of Kirby Cane and later Ellingham. He served as chaplain and head of religious education at a forces school at Gütersloh, West Germany, until 1967. He spent four years lecturing at St Mary's College, Cheltenham, before his diocesan role in Norwich. He became an honorary canon of Norwich Cathedral in 1977 until he retired from his diocesan training role in 1995. He had a lively sense of humour and although a clever man, wore his learning easily. He was awarded the degree of Doctor of Philosophy from Lancaster University in 1983, adding to his MA (Master of Arts) from Bristol in 1963. An author, he wrote several books, including the Christian Fringe and Preparing to Preach, which was published in 2005. In 2000, he became the first director of the Norwich Cathedral Institute, which was a partnership between the University of East Anglia, the diocese and cathedral. After the death of his wife, Jill, who was well known in the diocese as a maker of robes for clergy and lay readers, he married Sheila in 2000. A family man, he leaves three children by his first wife, Susan, Timothy and Simon. Funeral arrangements to be announced. 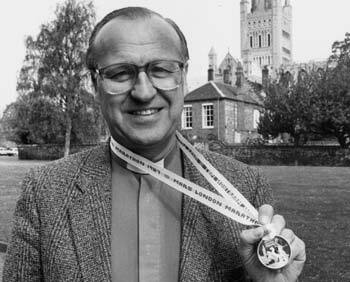 Pictured above is Canon Maurice Burrell with his London Marathon medal. Maurice was a great man, a true man of God. As a former pupil of his I appreciated his gentle teaching. Maurice was a god listener. He had a wonderful gift of discernment and cold always see both sides of an augument. My experience of Maurice was of a kindly, godly man with a winning smile and an aura of serenity.